Last night we went to see Knights of the Arcade, a Dungeons & Dragons inspired improv comedy show that I have seriously been trying to see for like two years. Full article on that next week. For now, read on and find out what I've been reading this week. 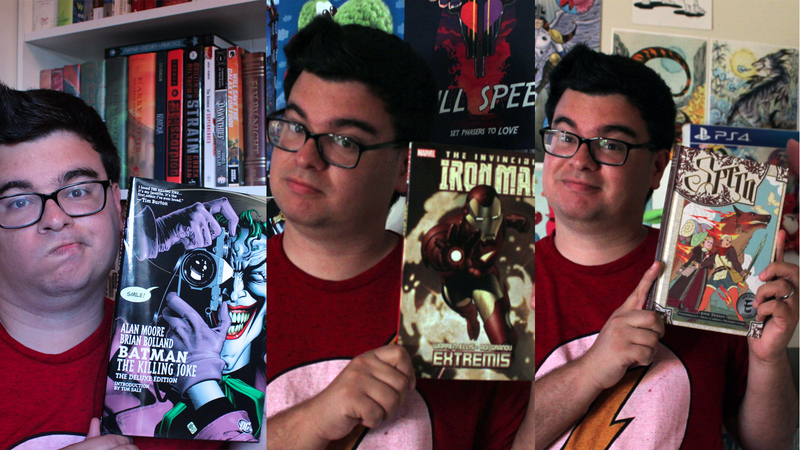 I basically read a bunch of comics this week! Extremisis the Iron Man story that Iron Man 3 was based on and it's waaay better than the movie and probably my favorite Iron Man story ever. It's got beautiful artwork and the way Tony's powers completely change is way more interesting than whatever that movie was about. This next one I wasn't too much a fan of. I didn't hate The Killing Joke, but rather I just don't get all the hype. It's a Batman story that tells a pretty intense encounter with The Joker and... that's pretty much it. I've seen it hailed as the best Batman story ever but honestly I just think it was kinda okay. The high point for me was the flashbacks that tell the Joker's tragic backstory. It was a good read, but honestly kinda short with an ending that kinda comes out of nowhere when I felt like there was room for another act. The art was fantastic though. I read the Deluxe Edition which has new colors that are apparently more somber than the original. Last thing I read was a book called Spera. Volume 1 is four chapters plus a collection of shorter stories that are all more or less in continuity (I guess?) and every chapter/story is illustrated by a different artist based on scripts by a single writer. Spera is a magical fantasy land where two princess and their fire spirit companion flee to live a life of treasure hunting and demon slaying. It's a simple story but the characters are charming and the constant shift in art style keeps it interesting. There is one short that looks like 90s style black and white and green Gameboy graphics, has a very Link's Awakening feel to it. Tomorrow we've got Kennywood Comicon and next week is the Kaiju Big Battel, so I've got a lot going on. Tell me what you did this week in the comments and let me know what you got going on next week!